In this image released by HBO, Al Pacino portrays Joe Paterno in Paterno, a film about the late Penn State football coach. The movie directed by Barry Levinson debuts April 7. Sandusky would eventually be convicted of 45 counts of sexual abuse. The focus of the scandal quickly became what exactly Paterno knew about the abuse — and whether he had done enough to stop it. He was fired by Penn State University four days after Sandusky was arrested. Paterno would die of lung cancer just two months later. Before he was fired, Paterno said called the incident "one of the great sorrows of my life." Those tumultuous days are depicted in a new HBO movie, Paterno, directed by Barry Levinson. Paterno is played by Al Pacino, who has a history of teaming up with Levinson to play real-life figures of controversy, including assisted-suicide proponent doctor Jack Kevorkian or producer and murderer Phil Spector. Levinson spoke to NPR about Paterno's passions, his complicity and the controversy's relevance in the wake of many prominent assaults being brought to mainstream attention. When, on one Saturday he wins 409 games, making him the most successful coach in college football ... all of a sudden he's enmeshed in this whole scandal that breaks open and a fall from grace in a two-week period. I thought this was a rather amazing story of a man who was revered and then just literally crashed to earth. On his tendency to tell stories that "could be branded as nonjudgmental portraits of notorious middle-aged men"
You never particularly think about how all these things connect in some way — they're all sort of biographical pieces to a certain degree, but it's by happenstance these particular films came about. One of them, I guess, would be Paterno's obsessive focus on football. At the very beginning of the film, Paterno is asked if he's seen the papers detailing the allegations against Sandusky, and he says, "No, I've got the Nebraska game coming up." He's constantly consumed with football at the expense of everything else, and I thought it was important to lay that in upfront, in terms of how he actually functioned. And then, of course, you begin to see the consequences of that. I guess you would say that voices have to be heard. You can't just simply, as people have done in the past, cover it up. If you take this situation as an example ... Sandusky had sexually molested a young boy, and they knew it. If they had addressed it at the time, it never would have become the scandal it became, and that would have been the end of it. Instead, they covered it up, and then there's another molestation, and they covered it up, and there's another. We have to take and pay attention to things that are going on, and deal with it. If you try to cover it up, at some point, it explodes. Joe Paterno's fall from grace was swift, sudden and completely unexpected. In November 2011, the Penn State coach set the record for the most wins in the history of Division 1 college football. Then less than two weeks later, it all came crashing down. Former assistant coach Jerry Sandusky was charged with molesting young boys. Quickly, the focus of the scandal became what Paterno knew and whether he had done enough to stop it. Those tumultuous days are depicted in a new HBO movie, "Paterno." 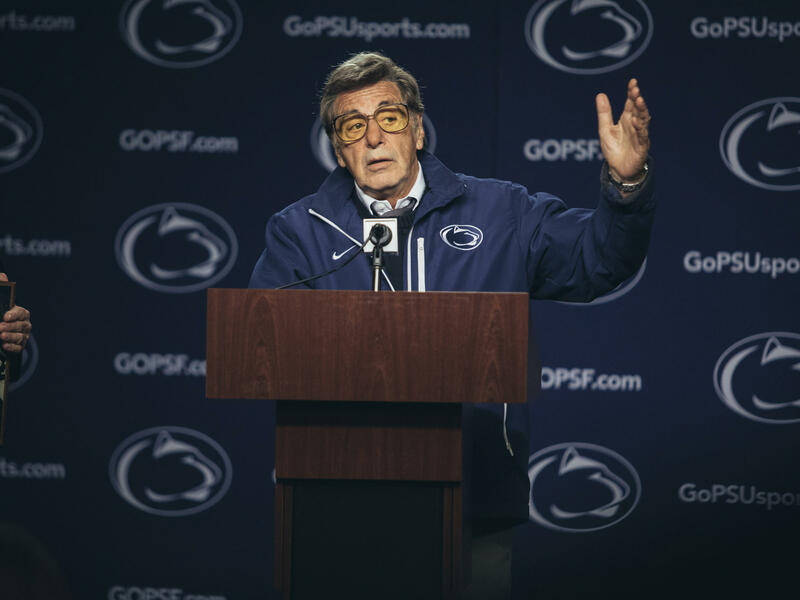 Paterno is played by Al Pacino. GREG GRUNBERG: (As Scott Paterno) People think that you knew about all of it. GRUNBERG: (As Scott Paterno) 2001, 1998. PACINO: (As Joe Paterno) Ah. GRUNBERG: (As Scott Paterno) Well, Joe Pa runs the school. How could he not know? PACINO: (As Joe Paterno) Well, I didn't know. I don't know what they're talking about. I didn't know. DETROW: The movie is directed by Barry Levinson, and he joins me now from our New York bureau. Thanks for coming in. BARRY LEVINSON: Hi. How are you? DETROW: So you've compared this story to an amazing Greek tragedy. What was it specifically that drew you to the Penn State story, the Joe Paterno story? LEVINSON: Let's just take it this way. On one Saturday, he wins 409 games, making him the winningest coach in the history of college football. He was known as a humanitarian and educator. He was like the spiritual force of Penn. All of those particular things. And all of a sudden, he is enmeshed in this whole scandal that breaks open. And then that fall from grace in a two-week period I thought was a rather amazing story of a man who is revered and then sort of, like, just literally crashing to earth. DETROW: ...Very fast. You've partnered with Al Pacino for decades. And in your HBO projects together, you've told the stories of Phil Spector, the record producer convicted of murder, Jack Kevorkian, the doctor who advocated for assisted suicide. The Hollywood Reporter put it this way - they said you guys have made a series of telefilms that could be branded as nonjudgmental portraits of notorious, middle-aged men. I wonder what you make of that portrayal. LEVINSON: (Laughter) It sounds OK in that regard. You know, you never particularly think about how all these things connect in some way. You know, they are sort of biographical pieces to, you know, to a certain degree. But it's just by happenstance that these particular films came about. I mean, the one thing that you could look to is that, you know, HBO does these type of films - these sort of humanistic pieces, which you can't do theatrically anymore because most of the theatrical now basically doesn't deal much with human beings. DETROW: What were the discussions like between you and Al Pacino when you were trying to figure out what was important to emphasize or to portray about Joe Paterno during this period? LEVINSON: One of them, I guess, would be the fact that - you know, his obsessive focus on football. At the very beginning of the movie, you know, they're saying, did you read the papers that came out? And he said, no, I got Nebraska. You know, he's constantly consumed with football at the expense of everything else. And I thought that was sort of important to start to lay that in up front in terms of how he actually functions. And then, of course, you begin to see the consequences of all that later on. DETROW: Yeah. I want to talk about a moment toward the end of the film where there's a psychologist. And he had been working with one of Jerry Sandusky's victims. And he says hey, this shouldn't be about Joe Paterno. This should be about the victims. UNIDENTIFIED ACTOR: (As character) I honestly don't know why anybody is talking about Joe Paterno. Somebody six months from retirement failed to see the big picture and didn't vigorously protect children? Of course you'd fire him. It's spectacularly unworthy of conversation. I'm sorry. A crime against children happened. Why the heck is anyone talking about Joe Paterno? DETROW: What do you make of that moment? Because you put the scene in the film, but the name of the film is "Paterno." LEVINSON: There is more than one thing in a movie. It's not doggedly just chasing one thing. It is more complicated than that. You see in a sense the complicity, how the administration ultimately covered things up, how they let these things slide. You see it from the standpoint of a young boy who tried to get information out, how it was ultimately, you know, covered up and the abuse that he had to face. And then there is the Joe Paterno - of a man that was revered. And how is it possible that this could happen under his nose? DETROW: Over the last year, we've seen so many versions of this story play out in different degrees - abuse or assault being overlooked because someone was too important to an organization or just because it was inconvenient to deal with. Are there any lessons that you hope viewers walk away with, watching this movie in 2018? LEVINSON: I guess you would say that, look. Voices have to be heard, and you can't just simply, you know, as they've done in the past - is just cover it up. If you take the Penn thing, and you say, all right, Sandusky had sexually molested a young boy, and they knew it. And if they would have addressed it at the time, it never would have become the scandal it became. We have to take and pay attention to elements that are going on and deal with it. And if you try to cover it up, you cover it up, and at some point, it explodes. DETROW: That's director Barry Levinson. His new movie is "Paterno". It premieres tonight on HBO. Thank you so much. LEVINSON: Thank you. Transcript provided by NPR, Copyright NPR.